One look at the big amethyst gem on this page and you would be amazed its extreme dimensions. Cutting gems to dimensions like 26x9mm is a tremendous challenge. The extravagant length of this big fancy cut amethyst gems is combined with a narrow width, a combination that will give you an indication of the degree of expertise required to successfully complete the cutting operation. The idea was to deliver a geometric view of the gem with a narrow appearance. This is made possible with a handsome thickness assigned to the long gem, the narrow structure is supported with a 14mm thickness. After experimenting with various thickness options ranging from 9mm to 14mm, we concluded that 14mm was the best choice. 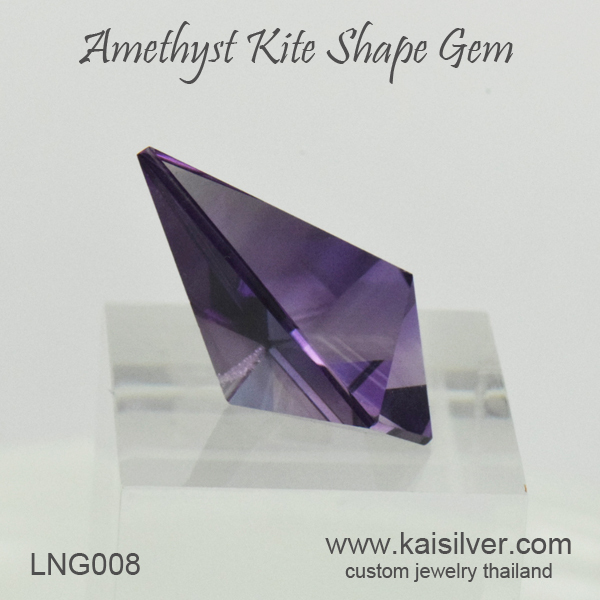 The gem is now stable and can be easily, set in an amethyst ring or pendant. The 20 carat amethyst fancy cut gem sells for just 475 U.S$, a smart buy considering that extremely few skilled cutters would attempt such a shape and cut. Contact the Kaisilver support team at sales@kaisilver.com with any questions that you might have. Widely acclaimed as the leading online source for fine custom made jewelry, we generally prefer to craft complete jewelry with gems of your choice. We provide the same quality for gold and 925 silver jewelry and can work with your designs or ours. If you have a requirement for a unique gem or a fancy cut gemstone, contact our team. We might be able to fulfill your requirement if our production line has unused capacity at that point of time. 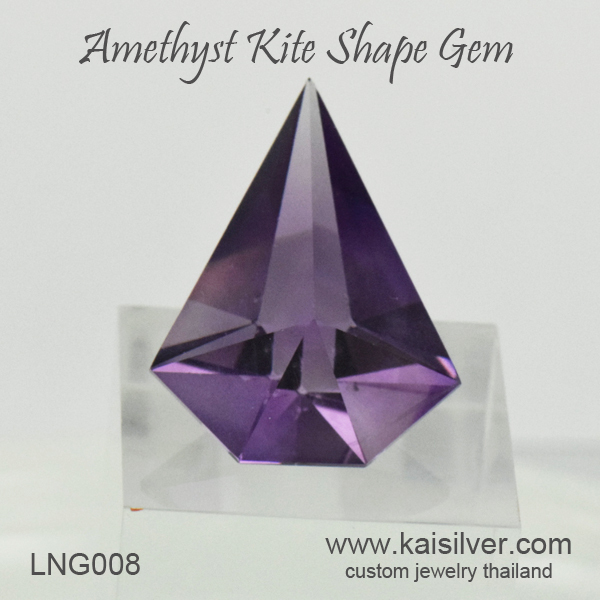 Pricing for these unique gems cannot be calculated on the market per carat price, each piece showcases gem cutting at its best and works to enhance the beauty of a natural creation.